The sun's out, the birds are chirping and you have some guests to entertain. 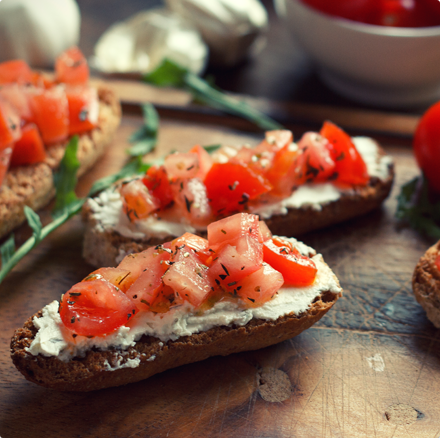 Don't let the heat scare you away from cooking at home--here's a list of quick, sunshine-friendly recipes that will entertain and impress any party guest. 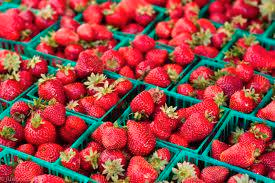 Below we have great recipes for Strawberry Scones, Salmon Steak Omelettes, Lobster Tails, Grilled Balsamic Asparagus, Tomato Bruschetta, Mojitos, Caesars, and Orange Julius! - Preheat oven to 400F. Lightly grease cookie sheet. - Cut fruit into small pieces. - Combine sugar, flour, baking powder and salt in a large bowl. Add butter and combine. - Add fruit and cream or buttermilk. - Knead dough on a lightly floured surface and form circles 3/4" thick. Half into wedges with a knife and place on a baking sheet. - Bake scones for 15 minutes. - Sprinkle tops of scones with an additional tbsp of sugar and bake for an additional 5-10 minutes until tops are golden brown. - Garnish with a dollop of jam or cream. - Remove the skin and bones from the salmon; cut into 1/2" chunks. - In a skillet, sauté the salmon, onion, and green pepper in 1 tbsp butter. - In a small bowl, beat eggs. Melt the remaining 1 tbsp of butter in same skillet on medium-heat and add eggs. As eggs set, lift edges, letting uncooked yolk flow underneath. - When the eggs set, spoon salmon mixture over one side, then sprinkle with cheese and pepper. Fold omelette over filling. Cover and let stand for 1-2 minutes or until cheese is melted. The sunny July weather can only mean one thing: BBQ! - Squeeze lemon juice into a small bowl, and slowly whisk in olive oil. Whisk in salt, paprika, white pepper and garlic powder. 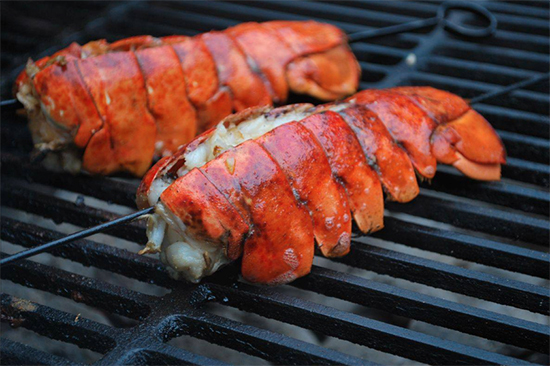 Split lobster tails lengthwise with a large knife, and brush flesh side of tail with marinade. - Lightly oil grill grate. Place tails, flesh side down, on preheated grill. Cook for 10 to 12 minutes, turning once, and basting frequently with marinade. Discard any remaining marinade. Lobster is done when opaque and firm to touch. - Snap off tough ends of asparagus and wash well through 2-3 changes of cold water. - Combine balsamic vinegar, fresh lemon juice, olive oil, soy sauce, garlic clove, and salt with the asparagus in a large zip-top plastic bag, seal and marinate for 30-60 minutes. - Remove the asparagus from bag (discard marinade) and place on preheated oiled grill rack. - Grill 5 minutes on each side or until asparagus is done. - Season with pepper for taste. - Preheat the oven on broiler setting. - Slice a French baguette into 3/4 inch slices and place on a baking sheet. Broil for 1 to 2 minutes until slightly brown. - In a bowl, toss together 8 diced grape tomatoes, 1/3 cup of chopped fresh basil, 1/4 cup of shredded parmesan cheese and 2 minced garlic cloves. - Mix in 1 tbsp of balsamic vinegar, 1 tsp of olive oil, 1/4 tsp of kosher salt and 1/4 tsp of fresh-ground pepper. - Spoon mixture onto toasted bread. - Garnish with 2 chopped green onions. No party in the sun is complete without a pitcher of drinks. - Place lime juice, mint and sugar into a pitcher. - Using a muddle stick mash to release mint oils, and dissolve sugar into juice. - Add rum and lots of ice topped with club soda. - Garnish with fresh mint and lime slices. - Rim a glass with salt and juice from the lime. - Add vodka and clamato juice. - Season with pepper, Worcestershire and Tabasco sauce. - Garnish with the celery stalk and lime wedge. - Combine all the ingredients in the blender until frothy and smooth.